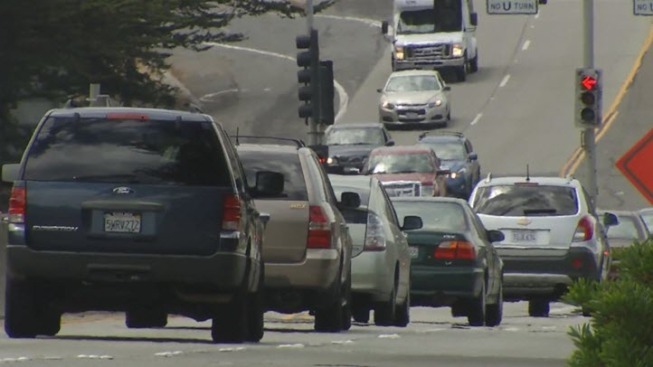 A Caltrans paving project on a half-mile stretch on Highway 1 in Pacifica has been postponed following a traffic nightmare that caused delays until nearly 10 p.m. Monday. The project was scheduled to be completed by 3 p.m., but Caltrans said the timeline was pushed back after a two-car accident sparked by a driver who went around the work zone and into the newly paved section of the road. "We had to wait for the asphalt truck, which was caught in traffic, to make its way to the scene," said Bob Haus, Caltrans spokesperson. "And we had to remove all the asphalt we had put down earlier in the day." Pacifica city leaders said they were unaware of the project and has now requested they be part of the planning process moving forward. "We didn't get any prior notice about this," said Joe Spanheimer of the Pacifica Police Department. "We found out about it as it was happening." When the city's police and fire departments learned that Highway 1 had become a parking lot due to the traffic mess, they had to make big changes. Crews moved equipment to ensure they could respond to emergencies while the main artery through Pacifica was cut off. "The way the fire department works, they designate certain engines to stay south of the slow traffic. We had some assistance from daily city engines," Spanheimer said. Caltrans officials said they will work with the city. Overnight is not an option due to temperature and safety issues on the stretch of road being worked on. Caltrans also said all paving work is now suspended until the traffic issues can be analyzed.